The genus name Allium is the Latin word for this plant. The species name, sativum, is Latin for "cultivated." The common name garlic derives from the Anglo-Saxon gae, "lance," in reference to the shape of the leaf, and lic, "leek." Garlic is believed to be native to central Asia but is widely cultivated. The leaves are long and flat, reaching up to 3 feet in length. The white, star-shaped flowers grow in umbels. 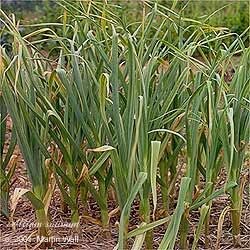 Garlic, a perennial, is a popular garden plant and does well in fertile, moist soils in full sun. Garlic shows activity against many types of infectious diseases, including staphylococcus, streptococcus, and salmonella bacteria. It also helps prevent blood platelet aggregation, which makes it of use in addressing problems of the circulatory system. It is used in the treatment of arterosclerosis, asthma, candida, catarrh, diabetes, high cholesterol, hypertension, obesity, tuberculosis, whooping cough, and worms. Topically, garlic can be prepared as a bolus to treat yeast infection or an enema to treat dysentary. An uncut clove can be used as a suppository to treat hemorrhoids. Garlic-infused oil can be used as ear drops to treat ear infection or as a wash to treat gangrenous wounds and snakebite. The garlic rhizome is edible and has been used as a seasoning since ancient times. However, it loses its medicinal properties when heated. Eating garlic is said to repel mosquitoes and ticks. Planting garlic in the garden helps repel pests. Excess amounts of garlic can be irritating to the stomach and kidneys; some people find that even small amounts of raw garlic can cause heartburn. Avoid large doses during pregnancy and while nursing, as it may cause digestive distress in the mother and baby. Some people may be allergic to garlic. Excessive use can provoke anger and emotional irritability. Do not apply cut garlic directly to the skin for more than a few minutes, as it can burn the skin.